Jio4GVoice is the brand new way of communicating with your Jio contacts and is released by Reliance Info-Communications. Is your regular smartphone is not providing you quality voice calls and video calls? Then, Jio4GVoice app is for you. This app allows you to make a video can voice calls using 4G of your Jio SIM to another 2G, 3G, and 4G mobiles. Even if your phone is on-VoLTE 4G phones, Jio4gVoice apk enhances the experience. You can use Jio4GVoice Android App to make HD Video and Voice calls to mobile and landline numbers. 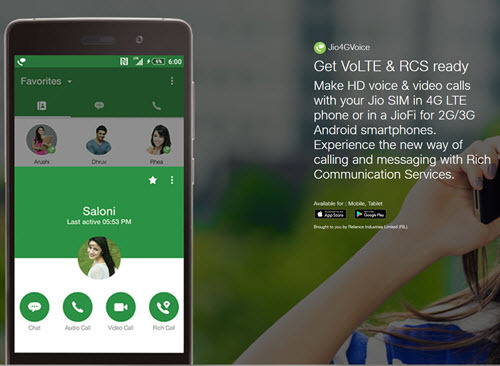 Using Jio4GVoice, you can use VoLTE features on your 2G and 3G phones with the help of JioFi. Download and install Jio4GVoice APK for free on your Android Phone. Jio4GVoice app allows you to have rich communication with other mobile and landline numbers. You need to have a Jio SIM, and VoLTE 4G supported mobile. But, even if you have 2G and 3G supported mobile, then make use of productive communication when your phone is connected to JioFi. Send and receive to and from Jio number. You can send customized messages, images, videos and files of every type to others. You can even make this as your default messaging app to have both your text messages and chat conversation in the same thread. Just dial the number on the dial pad and Jio4GVoice apk will make a call. Before you install the Jio 4G voice App on your Android device, you must download the latest updated version APK file. You can get the APK file from the above-provided links. Okay, Downloaded the APK File, What’s next? Next, go to the file manager in your phone and navigate the Downloads folder and open the APK file. finished the installation then you will get a screen like below. The App will ask you to grant permissions for accessing your personal messages, Call data and your contacts. You must accept all the conditions in order to use this JioVoice App without bugs. You can also download MyJio App and check your balances. Supports HD voice and video calls. You can send customized messages, images, files of any type and more. Make HD Calls even on non-VoLTE 4G mobiles while connected to JioFi. You can make it as the default messaging app. 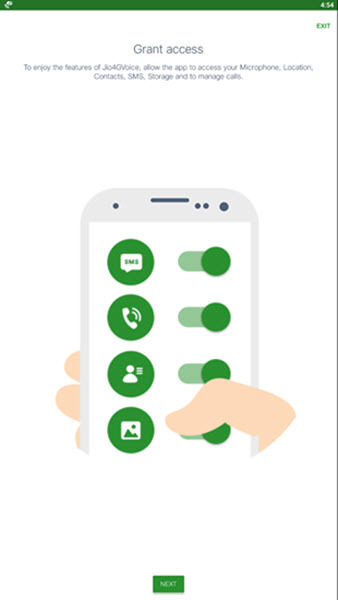 Use the ‘Urgent Call’ feature to mention that the call is urgent. Experience the rich communication using Jio4GVoice apk. This page was last updated on 8-10-2017. If you have any queries related to Jio Apps then don’t hesitate to drop your comments below. The recently released version is 5.2.1. This update was released by Reliance Telecom group. Right Now, Jio provides the fastest data services across India. They deliver up to twenty to hundred MegaBytes data per second. So, this allows Jio 4G Voice Android App or iOS App to make high quality VoIP voices calls and Video call without any glitches.